The Greek Lyceum was a school of philosophy founded by Aristotle near the city of Athens in 335 BC. Its purpose was to serve as a center for discussion, debate, reflection and study. 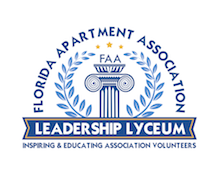 The FAA Leadership Lyceum works to identify and develop a well-informed and highly motivated group of emerging multifamily housing leaders; people with a broad-based vision for, and strong commitment to the mission and strategic objectives of the Florida Apartment Association and its local associations. A common challenge among FAA's 10 local associations is the ability to identify association volunteers who are trained and motivated to move the association forward; and, who have the time to volunteer and have the support of their employers. FAA began the Leadership Lyceum course in 2009. Any FAA member may enroll in the course through their local association. Lyceum candidates are required to complete three classroom modules that are five hours in length. They must attend one FAA Board of Directors meeting, one FAA Legislative Committee meeting, the FAA Legislative Conference and the FAA Annual Education Conference. If you're interested in more information or want to enroll, please contact your local association. The Nan Cavarretta Memorial Scholarship, managed by the Florida Apartment Association and administered in partnership with the AAGO Foundation, was established in 2015 to assist in the training and development of emerging multifamily housing leaders through FAA’s Leadership Lyceum program. Scholarship recipients are dynamic professionals who have a broad-based vision for, and strong commitment to, the mission and strategic objectives of the Florida Apartment Association and its local associations. Apply for a scholarship or donate to the scholarship fund. To sort this table, click on any one of the column headers.